I really used to like driving, but these days it reminds me of Darwin’s theory of evolution. In this case it’s complete failure to root out the dimwits that cross the road in front of me when driving. 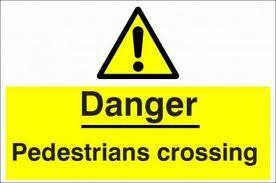 Pedestrians – An endangered species? Driving home on an average evening I am spending a small fortune on brake disks as they gather by the side of the road and wait until I am all but a few metres away, going at 30 mph, and then they strike. Now I’m all for freedom, but in the UK there are no jaywalking laws, which means any idiot can cross the road at any point, and at any time. But why, when I am traveling at 30 mph do you start crossing the road just metres in front of me, WHY! Perhaps this inability comes with the UK’s declining ability to do maths. Did these mindless souls miss the day the teacher did the whole “A car a is traveling at 30 mph… How long until it hits you?” thing. Or am I being unkind. How can anyone do maths and text, surf, and chat at the same time. Perhaps, and it’s just a suggestion, you mindless idiots, you could wait until you have crossed the big noisy thing with the loud whizzy things that kill. The “I have enough time to walk across the road, but after stepping out I’m going to walk progressively slower so that it takes me about 5 minutes to get across the road” crowd really grinds my gears. Especially the ones that then look surprised and get angry that, no, you did not adjust your speed because they were a complete idiot. My real frustration though is reserved for the sub-species, Pedestreeus Nolookus. These arrogant/ignorant creatures think that divine intervention is working overtime. They walk across a busy road right in front of oncoming motor vehicles without looking, and crossing diagonally with the flow of traffic. God help you if you honk your horn to warn them, because if they don’t have the “freeze rabbit in the headlight” gene, then they have the “Daily Mail, I’m always right” gene. Either way, your sound warning that their life is in danger will not make a jot of difference! At the rate we are going, we will either be driving at 5 mph forever, in which case there will be no point in going anywhere. Or we will be mowing down so many pedestrians, we will have killed off the economy and not be able to afford to drive. I’m going to do the human race a service and petition the United Nations to put pedestrians on the endangered species list, because they need protection from themselves.